The Prophecy of the Cloud. On December 22, 1962 in Jeffersonville, Indiana, just before 10:00 in the morning, William Branham said he saw a vision of Angels coming from the west in a pyramid-constellation. Shortly after this vision (and a year after the death of his mother), William Branham moved his family to Tuscon, Arizona, where he said the vision was fulfilled, commissioning a series of sermons on the Seven Seals. 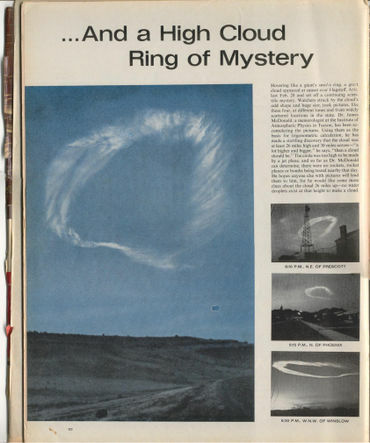 Was this the prophecy that foretold the appearance of the sign of the Cloud in the heavens? 2.1 Five or Seven Angels? 2.3 Why Did the Number of Angels Change? One week later, William Branham spoke a sermon entitled "Sirs, what is the time?" December 30, 1962 also spoken in Jeffersonville, Indiana. The remaining quotes are all taken from that sermon. And way off into eternity I saw a constellation of something coming. It looked like that it might've been little dots. There could've been no less than five, and not more than seven. But they were in the shape of a pyramid, like these messengers coming. Knowing nothing about it, a blast come forth and here come seven angels from eternity. Is these seven angels in this constellation that came to me... When I meet you at the day of the resurrection, you'll see that I lie not: God my Judge. Could it be that? The mighty thunder, or the seventh angel in the seven constellation, seventh period constellation, the pyramid made in a form, three on a side, and one on top, and they dropped from eternity. Could it be? Is this the mystery of the thunders that will bring back the Headstone? Did William Brsnahm's discussion with Lee Vayle impact William Branham's recollection of the vision? Why did the number of angels change from clearly being five to being seven? 'I'm asking you the question. It blasted with thunder when this voice rung out. Did you notice that when the seven seals, that followed the seven church ages; when the first seal was opened, that there was a thunder? The first seals in the Book was opened, there was a thunder. I looked to the west; and it looked like in a form of a pyramid, like two on each side with one in the top, came five of the mightiest Angels I ever seen in my life. They were around me. I couldn't see them, but I'd been brought into this constellation of a pyramid of them, inside this constellation of--of Angels, of five… And I thought, "Now, a death angel would be one, five would be grace." And they were in a--in a--coming from this way. And they were looked like one, two, three, four, and then one right at the top, making five. He is very clear from his testimony that he saw 5 angels, because he repeats this five times in this sermon. In Chapter 3 of the book, "The Twentieth Century Prophet", Lee Vayle states that he met with William Branham on December 26, 1962 and discussed this vision. He wrote that they speculated whether the vision could relate to the unveiling of the seven thunders of Revelation 10. When William Branham retells the same vision on December 30, 1962, seven days after his first retelling, the number of angels begins to change from 5 to 7. So on December 23 he is very clear that there were 5 angels in his vision, but on December 30th, he seems unsure as to whether there were 5 angels or 7 angels. Numbers were very important to Bro. Branham. In his sermon on December 23, he mentions the number 5 ten times, and the number 7 only five times. Then in his sermon on December 30, he mentions the number 5 seven times, and the number seven 64 times. But these sermons are about the same vision! And these Seven Seals, as you know, is just the manifestation of the seven angels of the Seven churches; but, there are Seven other Seals that's on the backside of the Book, It's outside the Bible. The people are present now, the six people that had those dreams. Isn't it strange there wasn't Seven? Isn't it very strange? William Branham obviously paid very close attention to his discussion with Lee Vayle. Then, after he had introduced some doubt into the minds of the people as to how many angels he saw, he now lands decisively on the number seven. Is that why William Branham changed the vision from 5 to 7 angels? Did he change the vision because he knew he was going to be preaching the seven seals and wanted the vision to tie into that? You may also be wondering why the cloud is not mentioned in this vision, if it was so important? But that is a topic for another video. This page was last edited on 22 August 2015, at 04:06.